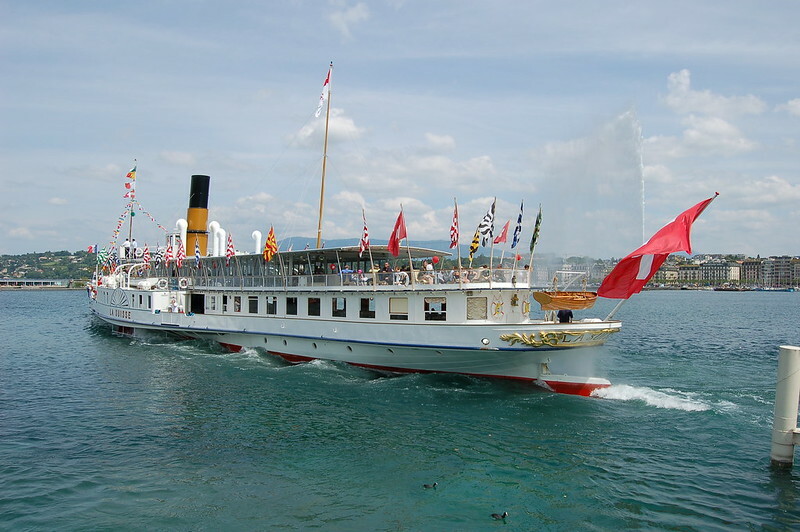 The Compagnie Generale de Navigation’s fleet of paddle steamers is a familiar and much-loved sight on Lake Geneva. The eight vessels were originally built between 1904 and 1927, and by the millennium were naturally showing their age. This was a matter of great concern to all who loved travelling on them: no-one wished to see their demise. The fact that these remarkable vessels, several of them equipped with their original steam engines, can still run regular services on the lake is the result of an on-going programme of restoration partly funded by their owners but also with the energetic support of a Friends’ organisation, l’Association des amis des bateaux à vapeur du Léman (l’ABVL), formed in 2002. Each of the eight has her own character, and different repairs and renewals were required. But the fleet as a whole can now be enjoyed again, and for many years to come, plying between two countries, France and Switzerland, and providing one of the more elegant experiences of European life, recapturing the serenity of less frenetic times.